A meteoritethe size of a huge watermelon on Mars is revealing new clues to the planet?senvironment. The Martianmeteorite weighs at least half a ton, making it much too large to have plungedthrough Mars? current thin atmosphere and hit the ground without beingobliterated upon impact, rover scientists said. Either the atmosphere wasthicker than expected some time in the relatively recent past, scientistsfigure, or the rock fell to the surface billions of years ago when theatmosphere was thicker. NASA?s Opportunityrover discovered the metallic meteorite - which scientists now call BlockIsland - in late July, then drove up to take a closer look. "Considerationof existing model results indicates a meteorite this size requires a thickeratmosphere," said Matt Golombek, a rover team member at NASA's JetPropulsion Laboratory in Pasadena, Calif., in a statement. "Either Marshas hidden reserves of carbon-dioxide ice that can supply large amounts ofcarbon-dioxide gas into the atmosphere during warm periods of more recentclimate cycles, or Block Island fell billions of years ago." A planet?satmosphere can slow a meteorite?s fall due to the friction the rock encountersas it plows through the atmosphere after flying in the relative vacuum ofspace. BlockIsland is about 2 feet (60 cm) long, about half as tall and has a bluish tintthat sets it apart from its rust-colored surroundings, mission managers said. Itis 10 times as massive as Heat Shield Rock, another Martian meteorite found byOpportunity in late 2004. Themeteorite would have to be several times smaller than its current size to havesurvived landing on Mars today, rover scientists said. Space rockscome in several varieties, ranging from stone to iron and other heavy metals.They're typically fragments of asteroids chipped off in collisions or throughother natural weathering processes. Some land on Earth, and others hit themoon, Mars and other bodies. Since findingBlock Island, Opportunity has used its robotic arm to reach out and touch it,examining the object with a set of instruments at the tip, including an alphaparticle X-ray spectrometer that can identify elements of its composition. "There'sno question that it is an iron-nickel meteorite," said the spectrometer?slead scientist Ralf Gellert of the University of Guelph in Ontario, Canada. "We already investigated several spots that showed elemental variations onthe surface. This might tell us if and how the metal was altered since itlanded on Mars." 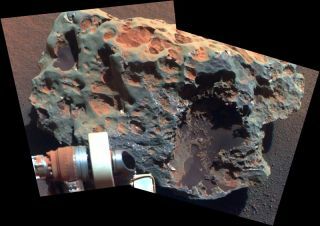 Close-upimages of the meteorite from Opportunity?s arm-mounted microscopic imager haverevealed triangular patterns on Block Island?s surface that match ones seen iniron-nickel meteorites found on Earth, mission scientists said. "Normallythis pattern is exposed when the meteorite is cut, polished and etched withacid," said Tim McCoy, a rover team member from the SmithsonianInstitution in Washington. "Sometimes it shows up on the surface ofmeteorites that have been eroded by windblown sand in deserts, and that appearsto be what we see with Block Island." By studyingvariations in the composition of Block Island?s exterior and comparing themeteorite with similar ones found on Earth, researchers hope to determine howthe rock may have withstood the rigors of time and exposure to any liquid orwater vapor. "Beforewe drive away from Block Island, we intend to examine more targets on this rockwhere the images show variations in color and texture,? said JPL rover teammember Albert Yen. ?We're looking to see how extensively the rock surface hasbeen altered, which helps us understand the history of the Martian climatesince it fell." Roverscientists plan to spend a good deal of time studying Block Island before resumingOpportunity?s trek toward its next stop Endeavour Crater. The giant crater13.7 miles (22 km) across and is about 12 miles away (19 km) from VictoriaCrater, Opportunity?s last pit stop. The rover has managed to complete aboutone-fifth the trip after a year of driving on Mars. WhileOpportunity studies Block Island, engineers on Earth continue to come up withan escape plan for its robotic twin Spirit, which has been stuck in deepMartian sand since early May. The two rovers have been exploring differentparts of Mars since they landed in early 2004.